I live in a house with a toddler and a partner, my toddler is constantly on the go and loves to create a mess. Recently we have had new floors put in our kitchen and bathroom and I have been wanting to make sure they stay in pristine condition. I have been cleaning them every day by hand with cleaning products from our local supermarket, I find it takes a lot of elbow grease to keep the floors gleaming and dirt and dust free. 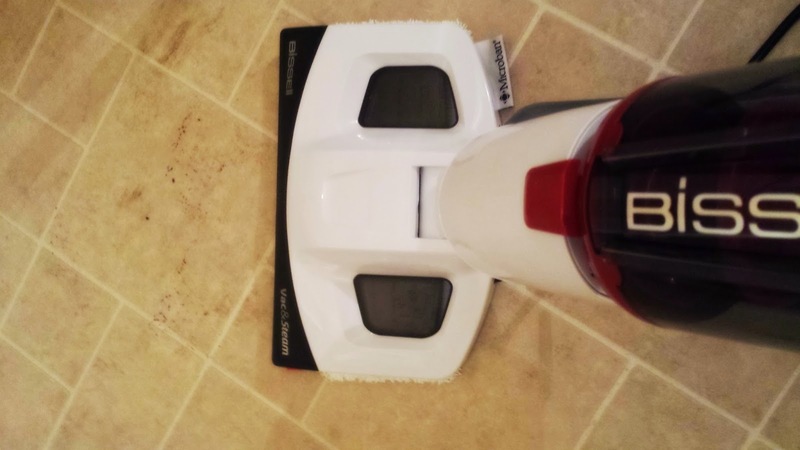 Recently I was sent the Bissell Vac & Steam cleaner to review. The floor has been getting quite muddy in our kitchen recently due to it being at the back of the house, when Ben, I or Maxwell go into the garden and through the back gate to the car we often traipse mud back through. Mud can sometimes be a pain to get off the floor and I can often end up sweeping the mud and then washing it and rewashing the floor again just so the floor is clean. I decided to use the Bissell Vac & Steam cleaner in my kitchen to start off with. The Bissell Vac & Steam cleaner is said to do the following things so I was excited to try it out. The Bissell Vac & Steam came in a box, inside the box there were instructions, the main unit, water cup, mop head and tray and a spare mop head. Both of the mop heads had different textures therefor the heads would give you 2 different lots of results. I found that the cleaner was easy to put together and it only took me a few minutes to do so. Once the device was up I decide to fill the water tank with water, I used two jugs of water and this filled the tank up. I then went on to plug the device in and had to wait a few seconds for the cleaner to be ready. After several minutes of use I could tell that the device did what it said on the box. The device vacuums well on hard floors, once you have vacuumed you then have the choice to vacuum and steam or do one or the other separately. 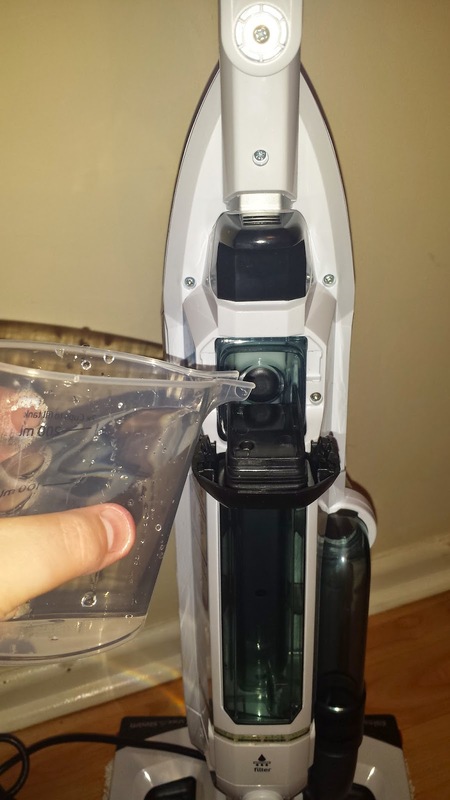 Personally I preferred vacuuming and the steaming as I felt that the device did not do as well when both features were used together however this is my personal opinion which may differ to others opinions. 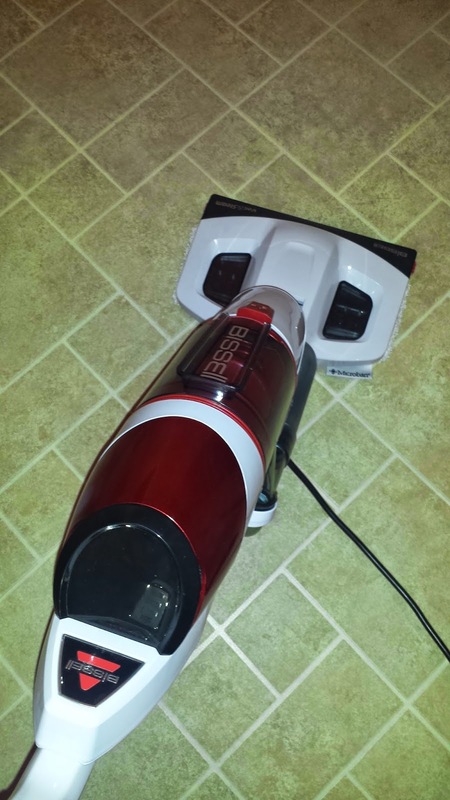 I thought that the Bissell Vac & Steam would leave my floors wet after I had cleaned them and I was dreading Maxwell slipping over on the floor as he loves to race around our house however the floors dried quickly which meant Maxwell was not put at risk of slipping over. A few small niggles which I had about the Bissell Vac & Steam were that I did not find the Bissell Vac & Steam to be lightweight, this is a shame as I would often enjoy using the cleaner upstairs in my bathroom however I will have to wait for Ben to be around so he is able to take the cleaner up and down the stairs for me. Another small niggle I had was that I found the cap on the water tank to be hard to open, I hope it gets easier to open over time but after the first few uses I have struggled to the cap. Although I found negatives to this product I also found that there were a whole load of positives. 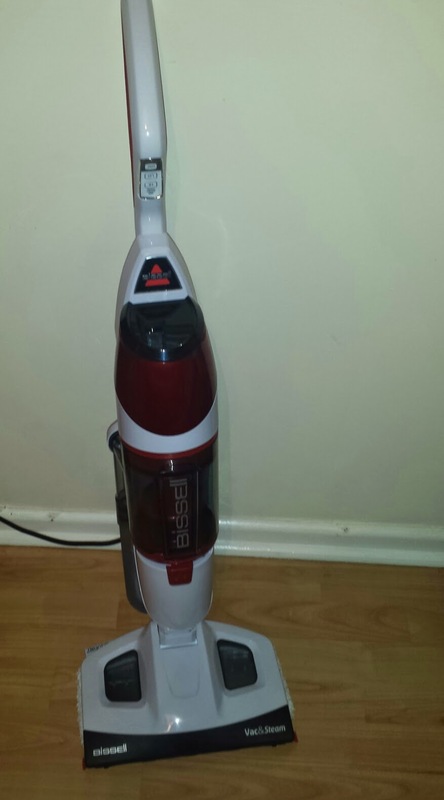 The Bissell Vac & Steam has a long cable, due to this I am able to take the Bissell Vac & Steam around my home with me which means I do not have to keep unplugging the switch, this saves time and is a great feature for the cleaner to have. There are no chemicals involved in this product so when steam cleaning I know there are no dangers around for Maxwell and I. The last positive which I like is that the Bissell Vac & Steam has reusable mop pads which can be used over and over again. This saves us money as I know that some cleaners use disposable mop heads which over a period of time can be expensive to its owner. The Bissell Vac & Steam retails at £149.99 which I personally think is a little high, I would be happy to pay £115 for this item instead. I would have loved to have seen a hand held type of steam cleaner built into this steam cleaner and as before I had a few little niggles about the device however this said the cleaner does do what it says on the box, it cleans floors well, leaves them damp instead of sopping wet and has the built in vac option which is very handy.